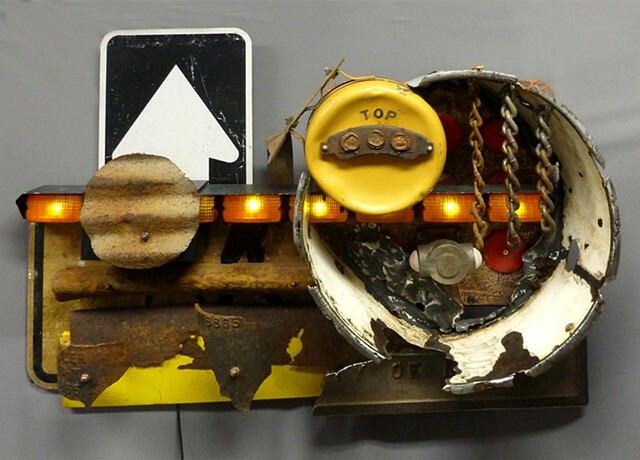 An engineer from the Traffic Department of the City of Moscow saw my 2013 show at the 3rd Street Gallery, the city’s art gallery and asked me to create a piece of art using junk from their “bone yard” at the maintenance yard and shop. Almost everything in the piece came from the bone yard: an emergency yellow light bar, a broken steel casting of a once-important sign, a one-way and a school crossing sign, a nine-reflector warning marker, broken pipe pieces, a very rusted half pipe, a miniature baseball, some worn out chain, a rusted corrugated disk and an inexplicable, rusted clothes basket from an abandoned washing machine. One might ask, “Where the hell did that come from?” Good question.